Recent historical gold highs have put the price under pressure. Detail examination of gold chart shows precious metal price forming tech pattern called “Head and shoulders”. For the moment we have clearly distinguishable head, left shoulder and currently shaping the right. This technical formation is reversal pattern. As we see the divergence between price trend and relative strength index (RSI) trend support this assumption. Breaking downward 50 moving average at $1346 would be prove for mentioned above and fall to major support line at $1270 is likely. As seen in recent market moves QE2 turned expectations higher. The question rising now is what is next direction? 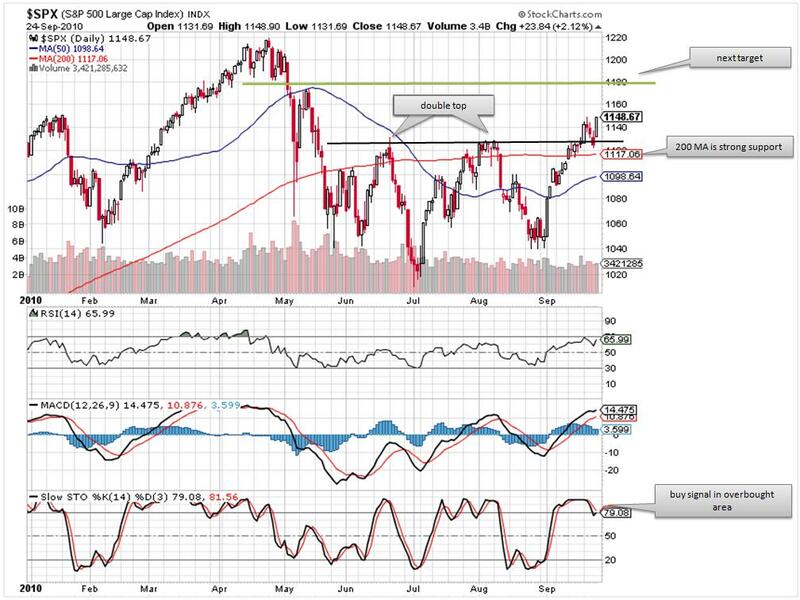 Generally speaking we are in overbought area and there is no doubt stocks now are expensive. This is visible not only from new market high, above April one, but looking at % stocks above their 50 MA. Indicator is measuring 82% of the stocks above mentioned moving average. In the day of QE2 easing announcement almost 45% of the 500 shares in S&P500 index closed at new 52 week highs. Latest close number fell to 12% and still they are close to 1 year highs. What to expect next? Considering the fact that FED is going to pump fresh $75 bln. each month till spring corrective intentions will be limited. However market needs fresh breadth. 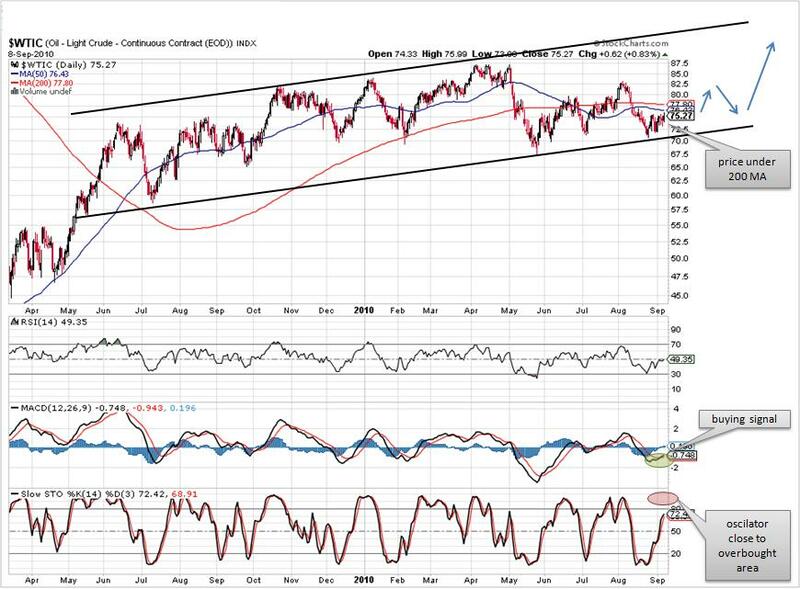 Mild correction is possible to first support level – 50 MA (1157), some 5.3% down. This correction will only be bull trend confirmation. 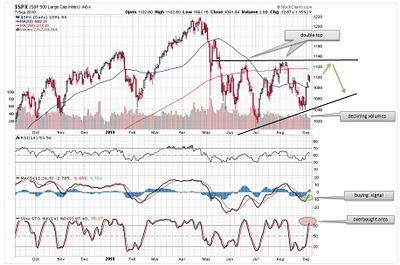 Looking at S&P, the chart shows some parallels regarding last April top and current picture. Oscillator indicators are overbought and money flow index is in declining trend after reached its peak before market corrected. This is suggesting down pressure. Time For Markets To Take a Break? Current market rally stand to be really strong. However markets direction is not north only and investors should looking for signs when market will take corrective breath. Many parallels can be found between current bullish market move and the one from beginning of the year (from February till mid May). Previous rally started before earnings season, as this did, previous rally was strong, almost 20% gain for S&P500 from through to peak, current gain is 12.3%. As seen on the chart, technical indicators are showing similarities as well. 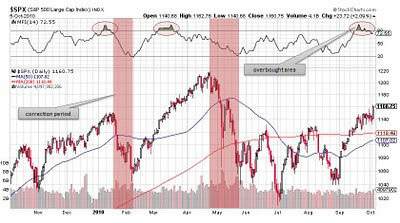 Relative strength index is gravitating around 70, moving averages of the MACD indicator are crossed at higher value and the histogram is fading before turning negative. 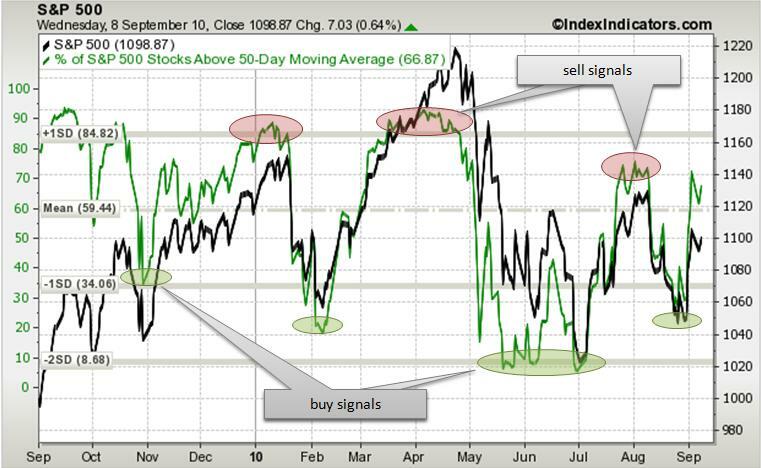 The clearest signal is market breadth measured by % of companies above 50-day moving average. Current value is showing 85% of the companies in the broad index S&P500 over its 50-day MA. 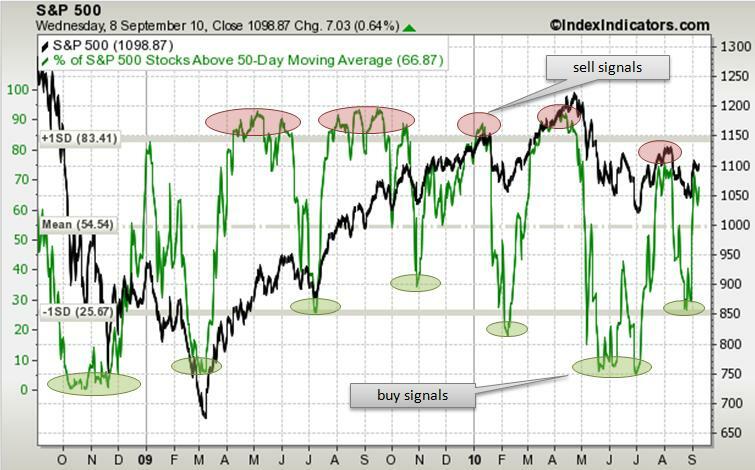 Values above +1SD (standard deviation), which is 85, are signal for overbought market. Another interesting similarity is crossing between % of companies above 50-day MA and the index (lower chart). Fortunately this is prior corrective signal. One month after it occurred market dropped. On the other side is very strong bullish signal called the golden cross – 50-day MA crossing 200 day MA from downside and both rising. 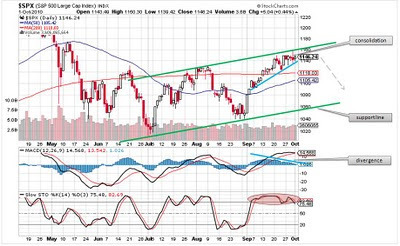 This is expected to give markets another positive wave but still they are overbought. If markets grow further then the fall will be bigger as it happened previous time with correction lasting two months from May to July. However fundamental situation now is different and scenario like this is less likely. This month review of the market breadth indicators is showing some interesting signs. 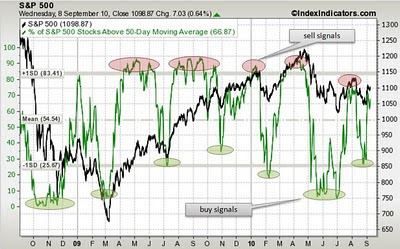 The number of stocks closed above 50-day moving average reached the overbought area of +1SD. This extreme value is suggesting only one thing – expensive market. The tricky in this situation is the point that stocks could stay in this levels for considerable time. If we turn back to previous top in mid April stalling period in the indicator could last up to month. In the same time S&P500 could continue climbing. 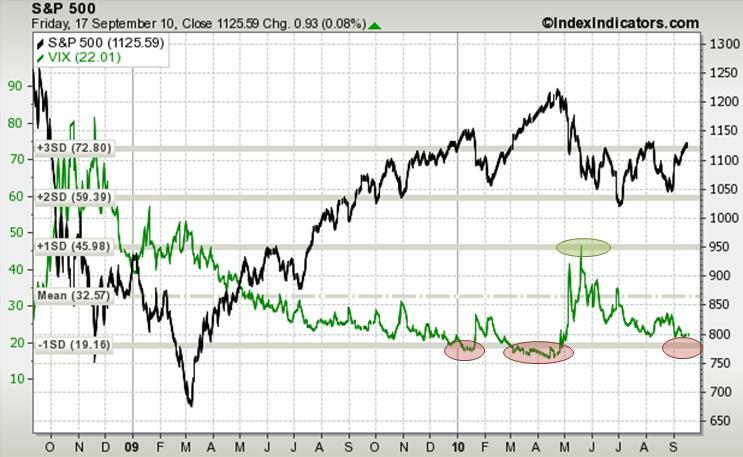 VIX indicator also is supporting current suggestion. Despite that fear gauge (now 20.63) is at lowest level since May it is higher than April values (17). There is no doubt that current trend of the market is bullish and it is expected to continue, but investing now should be cautious considering indicators values. There are many analysts sending free alerts or analysis telling you the big secret or the next shining star on exchange universe. It is the best if you control your choice by doing your own simple research at the beginning. You better know your need and at the end of the day you gain useful experience and knowledge. Picking stock is just like buying car. When you buy car you carefully select the best offer, choose performance characteristics - fast sport car for highways or heavy truck for bumpy roads. If you buy your car only because it has four wheels than you better don’t invest. You only waste time and worst - your money. So the car buying strategy is pretty much the same with picking stocks. You should pick sport fast growing stocks during expansion when economy is on highway but when it enters the rocky road of the recession than you have to switch. For selecting the most appropriate stock you have to use certain tools. Those tools are free and you can find them in the net. There are many sites giving you investing tools for selecting stocks but most of them are complicated so you have to spend hours to simply understand how it works. The most important thing is to create your own simple methodology for picking up and testing the stock. Something like black box in which you input the stock and output your decision based on this method. Following is descried such. You have the freedom to select whatever source of information you like. Mentioned are just for example. First step of this methodology is choosing the risk profile of the investment. If you want high gains than you should tolerate higher risk. Then you have to focus on the prospective sectors and industries for the current economic conditions. Briefly said during expansion you invest in stocks of cyclical sectors and during recession in noncyclical. Next step is to check latest news and developments about the company. Don’t be afraid from bad news. This is perfect possibility for making profit. Of course if the problem is structural and persistent than go away. After that check financial performance. You don’t need complicated financial models and valuations to see historical trend of earnings and to determine potential of growth considering current economic conditions. Take a look at ratios of the company, at least basic ones like PE (price per earnings) – showing how expensive is the stock comparing price to net income; debt to equity – showing debt burden for the company, lower the ratio better for the company; check also profitability ratios of the company – margins. You can find the ratios here. Next step is to review institutional investors. This is important, because if you own stock with small share of institutional investors the stock moves could be unpredictable to some extent. Institutional investors are professionals and perceived to be taking their decisions based on complicated valuation models and thus more accurate (although not always true). Insiders and insider trades in particular are signal for upcoming important event but sometimes they just exercise their expiring options. Technical analysis is important for timing your investment. Financial analysis is giving you the right stock but technical is showing you when to buy. Entering the position at the right time is giving you advantage, especially in flat markets. If you have some technical skills – good, if not check others opinion. You should consider that is is better if you learn doing it by yourself, because this way you follow both share and market closer and that is what is giving you the comprehensive experience. This is simple methodology for selecting stock. Stick to it and you will precise your choice. However this is just beginning. To be in time with the market you should do some in depth analysis and follow your choice. People change and stocks do. Don’t miss your profits by thinking your current choice will last forever. There are numerous indicators for measuring market strength. One of them has real predicting power. The Money Flow Index (MFI) is a momentum indicator showing overbought or oversold areas of underlying and strength or weakness of the trend. It is precise measurement because it is volume-weighted of the strength of money flowing in and out of security. It is calculated dividing positive money flow to negative money flow. 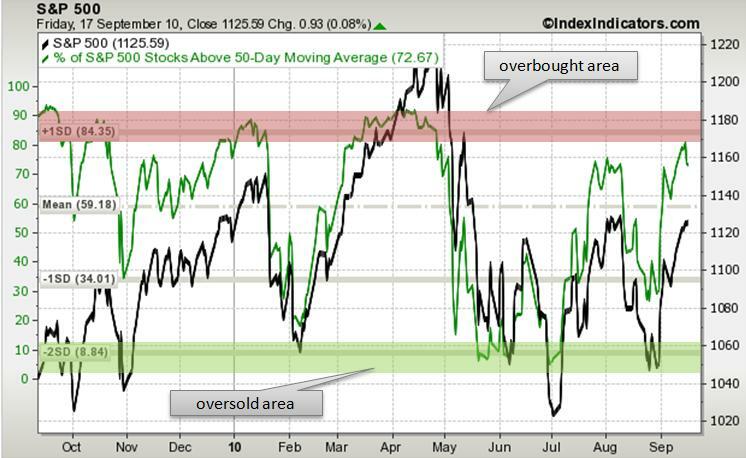 Readings are from 1 to 100, over 80 showing overbought area, under 20 – oversold. The chart shows movement of the broad US index S&P500 compared to MFI. Money flow index had values above 80 just before every major correction for last year. 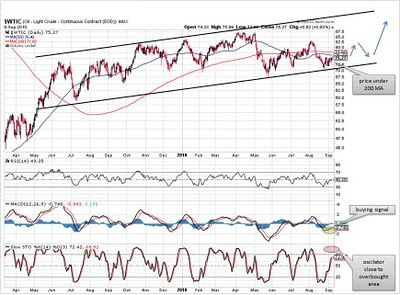 We’ve seen two significant corrections – one in mid January, second – April and now we are in the hot spot as MFI forming same pattern just like previous two times. It is no coincidence that market sell offs occurred just 2-3 weeks after the beginning of the earnings season. At the moment we are entering Q3 report period. Usually investor mood is positive before companies post results and everybody is buying in the wings of hope for better earnings. After the picture is clear some are cashing profits. Pattern is known as “buy the rumor sell the fact” trading. In this situation MFI index is inflated to 90’s before declining, despite of continuing market growth. Such a divergence is seen in the moment. After reaching 94.4 on Sept 21 MFI has dropped while S&P500 was still climbing. One should expect market correction 2-3 weeks from now considering mentioned above and previous two patterns. Of course there is exception as seen in April market fall as MFI entered overbought area almost 2 months before market dropped. This could be explained with over optimistic view of the market and expectations for V-shaped recovery at that time. It is not the case right now. How big correction might be depends on earnings report surprises but positive scenario could be seen here. October is starting with consolidation formed by last five indecisive sessions. S&P500 is tunneling levels around 1130 and 1160 - clear signal for exhausted power after wild September rally. Divergence between index and moving average histogram is suggesting correction but we have to consider October fundamental factors. The earnings season is to come, elections pending. 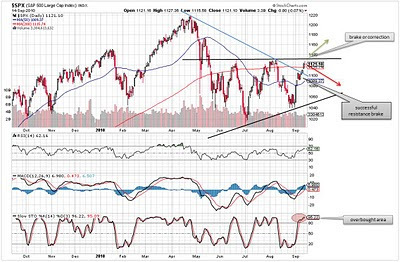 If we see positive signs from either reports or elections, rally will be continued otherwise there is time for corrective move with first support 1118 (200 MA) and bottom line 1060. Up To The Next Level Or Not? This September is reported to be the best in many years for the stock market and is showing signs for rising further. 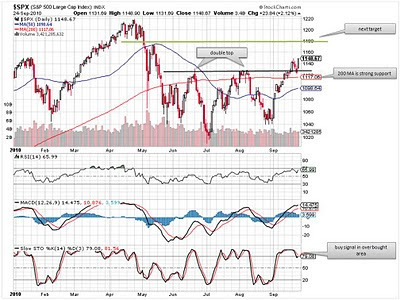 At current level S&P500 is above important 200 moving average and double top resistance level. Last week selling pressure was test of that brake. Hopefully it was not successful. 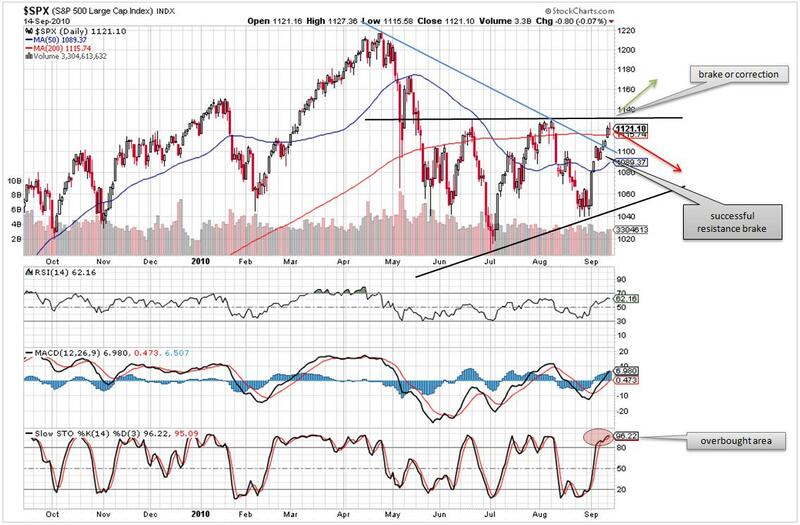 Now the index is headed north with technical target 1180. That is some 4% higher than current level. The question rising is whether this growth is sustainable. It depends on coming economic data as this week is revealing important macro numbers. Consumer sentiment, confidence and spending will show is recovery supported by consumers. Around 70% of GDP is formed by consumer spending. Positive values will support the rally. 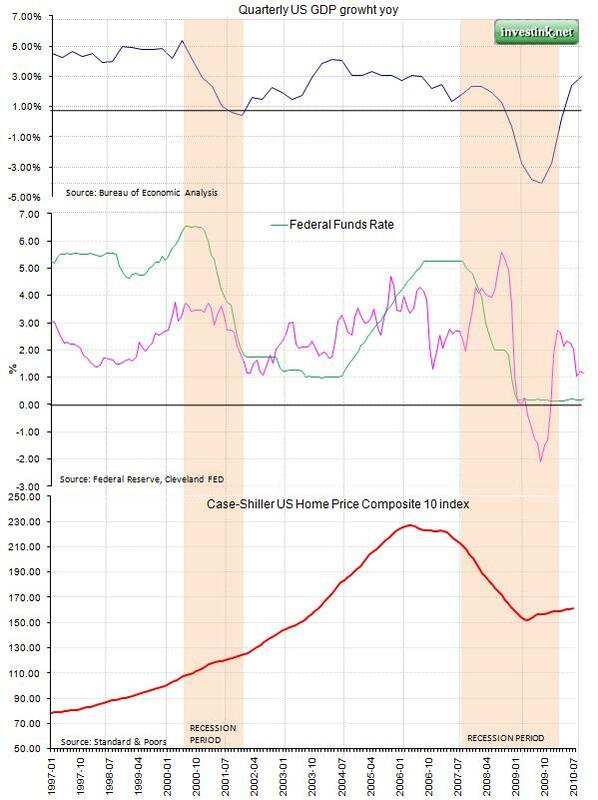 Case-Schiller Home price index will show is June rise in home prices continued in July. GDP revision and ISM forecast are giving positive mood for the week end with not expected down revision and rise in ISM. Recent improvement in some of the macroeconomic indicators are signaling positivity for the majority of investor public. Even National Bureau of economic research has stated the end of the recession started second half of 2007. From theoretical point of view if we have at least two consecutive positive growth quarters we have expansion and opposite for recession. Last recession is perceived to be the longest since great depression with 18 months length. Recent big market move since March 2009 is calculating sharp recovery. And it did happen, but is it sustainable? Improvement in macro indicators tend to lag after significant government intervention in the economy. This lag is 6 to 9 months. It is visible with the last bailout plan announced October 1, 2008. Just 6 months later (March 2009) the markets started improving sharply (as they fell) calculating strong recovery. Macro indicators started improving few months later. But reality now is different. The bailout effect has expired and government stimulus has gone so it is the moment at which the economy is showing its real face. Looking back in the previous two recessions GDP growth usually shows second slowdown in the middle of recovery. That is the point at which reality meet high expectations. Investors realize that this moment boom is government driven. As it often happens economy is not so bad as it is thought to be and not so good as we would like to be. The truth is somewhere in the middle. Let’s examine change in selected US macro indicators and their relation to stock market moves represented by broad index S&P500. This will help us determine at which point of the cycle we are and what to expect. 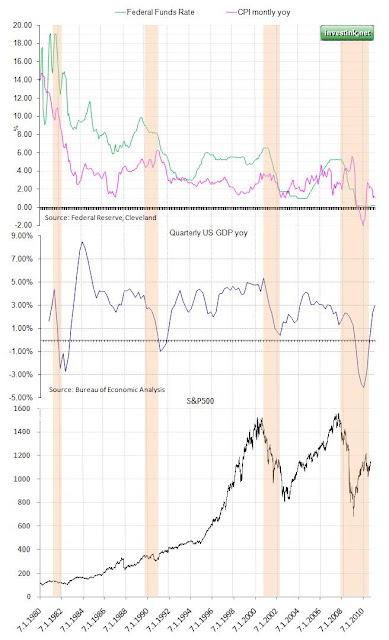 Time series include period from 1980 to date for quarterly data for GDP growth, monthly federal funds rate and CPI index data showing change on a yearly basis. The period includes four recessions: July 1980 – November 1982, July 1990 – Mar 1991, Nov 2000–Oct 2001 and last one: Dec 2007 – June 2009. Common in all of them is fall in GDP growth followed by fall in interest rates. The exception is 1990-1991 recession where we have rising inflation because of the 1990 oil price shock triggered by Iraqi invasion in Kuwait. The fall in interest rates is preceded by fall in stock markets. After the recovery of GDP growth supported by prolonged period of time with lower interest rates, the GDP number has short retreat. As mentioned above this is post recession effect. During temporary GDP pull back investment and capacity rise without real rise in demand. This gap is leading to subsequent slow down, but the recovery is still on track. 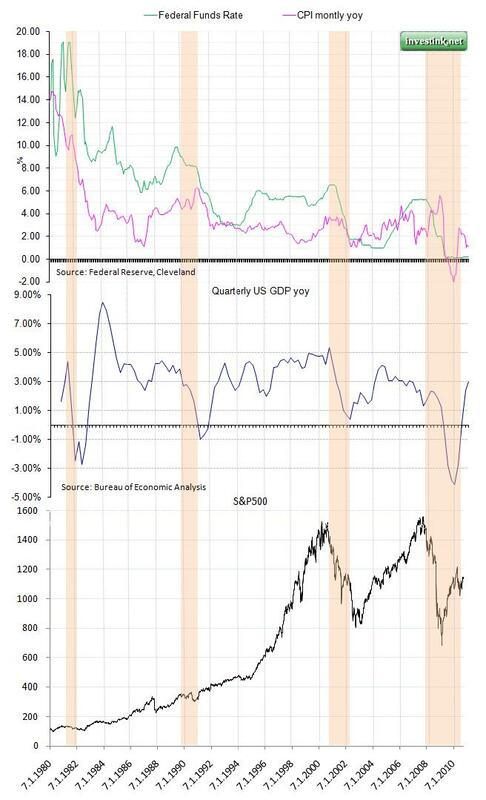 Closer look at last two recessions gives detailed information. Nov 2000–Oct 2001 recession was triggered by dot-com bubble burst. This slow down, although not the biggest in GDP numbers, has left stock markets suffering for a long time. GDP started recovering end 2001 while S&P500 turned bullish mid 2003. Interest rates were kept low almost two years and many blame that Greenspan’s decision for pumping sequential bubble – the housing bubble, which led to current crisis. Although started as a purely financial it shortly became economic crisis leading to 18 month recession – the longest since great depression. During that period inflation has peaked over 5% and then dropping significantly to -2.10% at the beginning of 2009. This raised question for deflationary pressure. Again this was oil price effect as it dropped from $148 Jul 2008 to $35 Dec 2009. The reason: world economy slow down hurts oil demand. Still housing sector has way to recover as prices are highly deflated from their April 2006 peak. 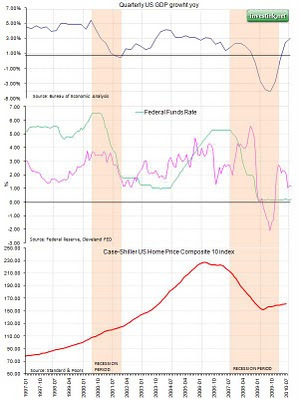 The drop in Case-Shiller Composite index since April top up to date is 29% although there is some recovery, which is positive sign. As seen in the chart this is supported by GDP recovery. Move of the stock market is perceived to be a measure for the overall economy. First chart proves it. Of course one should consider its inefficiencies and overreactions in both market directions. Interesting pattern seen in last two recessions is that bear market starts when interest rates begin declining. The drop in markets ends when interest rates bottom. From this point of view we can consider we have new long term bull market started. At this point we are on its first test. Usually stock markets trade expectations for future path of the economy. So markets have calculated the recovery and now are in idle position. As mentioned above and according to many economists we should expect slow down in GDP growth. This view is consistent with previous recession, where after weak recovery the growth slowed before continued its rise. If this is the pattern now we should expect minor pull back in growth and in stock markets. Of course the type of both recessions is different and the causes for them are, but the recovery pattern should be the same since the stagnation during that period affected all sectors with no exception. One significant difference from last recession to any other is the debt level. The main burden to growth now is debt ratio. Is has been constantly rising last years reaching unsustainable levels. 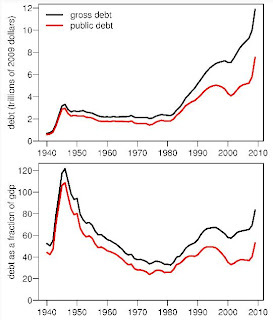 Now economy is entering period of personal debt deleveraging, which means lowering debt levels by shorting consumption. This is weighing on aggregate demand and hence GDP growth. The debt issue concern not only private but also public sector. 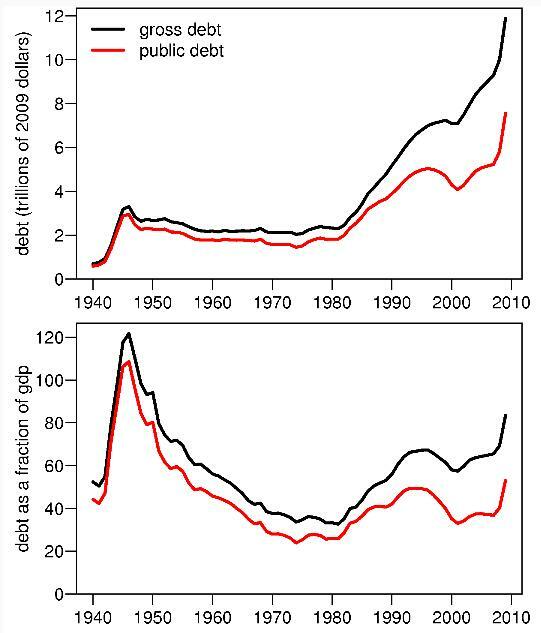 All government stimulus programs has led to significant rise of public debt. In other words printing money. This not only leads to unsustainability but lowers the dollar value and inflates the precious commodities like gold. And it is seen in the recent precious metal price. It broke $1350 and it will continue climbing further considering that facts. The recovery is imminent. The question is at what pace it will move. Current market level has priced sharp recovery and if new numbers are not satisfactory we could see another major market correction. Last week I pointed out the accuracy of using market breath indicator like percentage of stocks above their 50 MA compared to the moves of broad market represented by S&P500. I’m continuing following this indicator and adding another one. VIX is well known as a market fear indicator. It moves inversely with the market and entering certain levels shows clear signals of market reverse. 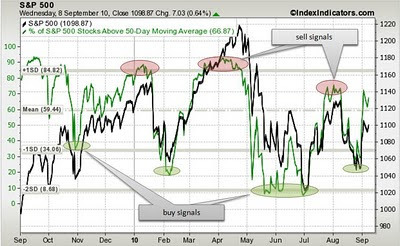 As seen from chart (more charts at indexcharts.com) the market (right hand axis) continued last week rally pumping stock prices higher with almost 73% of them above 50 day moving average. 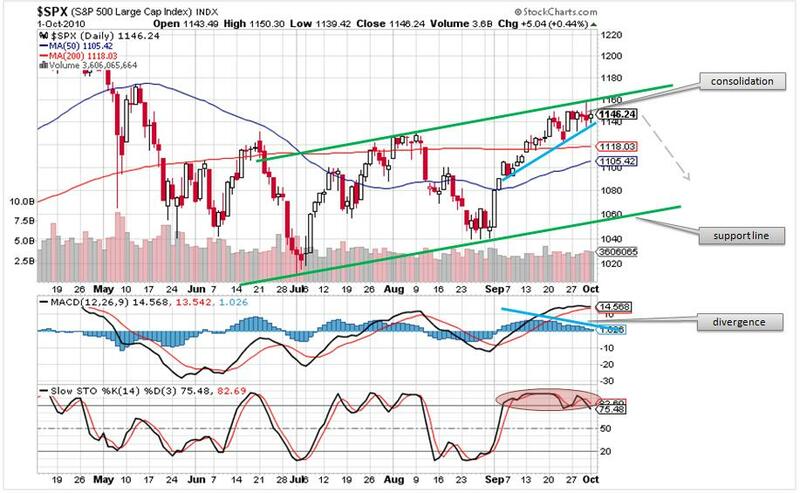 Thus indicator (green line, left hand axis) has reached levels close to overbought area. The overbought area is determined by +1SD (standard deviation) of the followed indicator. As I mentioned in previous post this has to be considered as a cautious signal, however it does not mean immediate fall. Indicator could stay at this area for a long time. VIX indicator is supporting this argument. At the moment VIX is 22.01. Values above 30 are considered to sign panic markets while lower measures point low volatility and growing stocks. Still there is more place for VIX to fall before it reaches overbought levels of the market. There is pattern for this indicator. Usually it saturates around oversold levels before reverse (market falls), which means rally can continue. It’s been really good month for the markets so far. S&P500 has gained 6.60% month to date, inspired by few positive macro news or US economy. 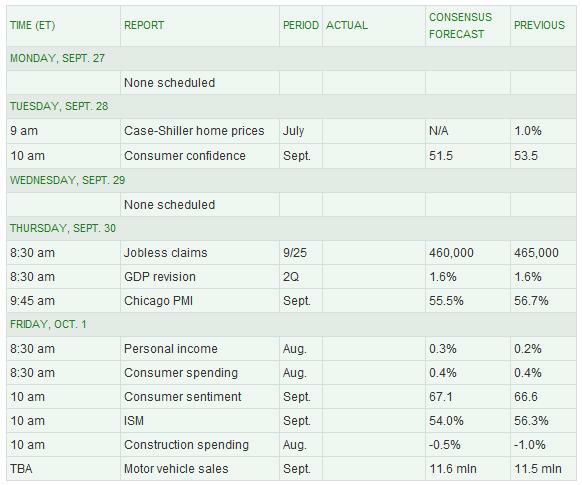 Better unemployment claims and retail sales helped fuelling the best rally since July. However at the moment markets are entering losing steam area. At this point every bad signal for the economy is excuse for cashing profits thus pushing prices lower. The chart shows successful brake over first resistance and moving forward to current level which is between double top resistance and 200 moving average. 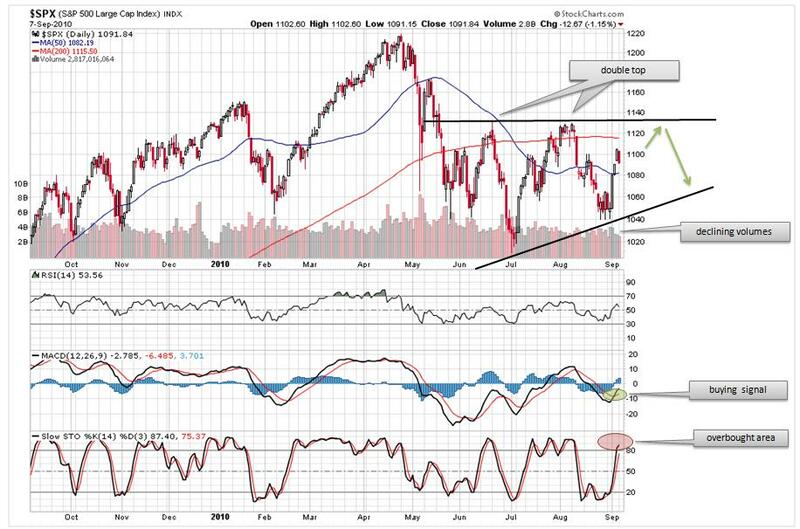 Still there is more room to grow as market breath indicators are not overbought, but close to this level. Considering that situation recent market moves has to be cautiously followed. 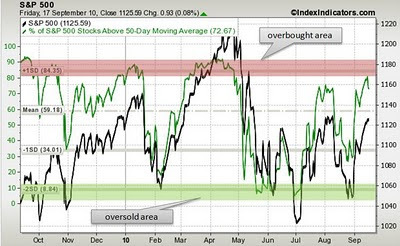 Perfect measure for the market breadth can be considered percent of stocks above 50-day moving average compared to the S&P500 index move. As most efficient things are simple it is simple. By showing number of stocks above its 50 day MA we can get an aggregate view of market condition - overbought or oversold at given time. As you can see on the picture whenever the indicator (green line) reaches overbought area, which is determined by +1SD (standard deviation) it is showing sell signal and soon after the market falls. We have same configuration but with buying signal when it reach -1SD area. Values over/under 1SD are showing extreme market conditions and are even stronger signals. To prove the accuracy of the indicator let us turn back to history. During last two years there’s been many buy signals. During bullish market after March 2009 repeated pattern occurred. After reaching -1SD value the indicator sharply turns back and reaches overbought area than staying there around 3 months before significant drop (market correction). During bullish market the correction is short which is visible on the chart. However last market selloff showed buy sign similar to this seen at the end of 2009. This could suggest that we might be entering new bear market. According to my observations this is not the case for the moment, considering recent market consolidation. Recent move of oil has reflected rising doubts over sustainability of US and world post recession growth. Slowing world economy lowers demand for energy and fuels. After steep correction lasting entire August at the beginning of September WTI is showing some signs of upward momentum. Still US inventories are quite big number (3.4 m for August) although slowing from 4.1 m barrels. This stock is fact due to slower demand trough summer months. Coming heating season is rising expectations for positive move of the price. From technical point of view WTI is consolidating just in line with the capital markets. Crude price is below 200 MA which leaves it room to grow but main price driving factor here are economic recovery expectations. I am expecting price consolidation to continue next 2 months with possible target $87 per barrel. After reaching two month bottom at the end of August S&P500 has rebounded sharply gaining 5.45% for only 3 days. That was retracement of the corrective move through entire August. Slowing macro indicators and persistent unemployment numbers cooled positive investor sentiment from first half of the year. Now after all positive effects from stimulus package has disappeared the economic reality is calculated in stock prices. Considering mentioned above from end of May the stock market entered consolidation period. S&P500 is moving like snake in the tunnel, trying to find direction. Investors are nervous about growing signs of second recession wave. It is not likely to happen rather slowing leading macro indicators like growth, industrial production and private consumption. This determine my view of continued consolidation with higher volatility over next 3-6 months. But if economic indicators worsen further even deeper correction is possible. Closer look at the index technical indicators shows mixed signs. Slow stochastic has reached overbought area. Crossing moving averages at MACD shows buying signal. One should consider that MACD is slow indicator. Relative strength index is in the middle (53.56) and still has room to grow. S&P500 is likely to test back 500 MA (moving average) at 1082 and then turn positive again targeting north – the area between 200 MA and resistance line. After that another correction is likely. This calculator shows you how much your monthly payment would be based on input data for your home. But it is more than that. If you want to see your payment ratio (interest vs. principal paid) for each year click pie chart button on the calculator. For more detailed monthly payment schedule click button showing clock. There you can follow your payments over time and see how much you’ve paid and how much is left. Clicking on the magnifier button opens even more detailed table with tax and insurance expenditures.